Like Cheney Fire and Rescue on Facebook! 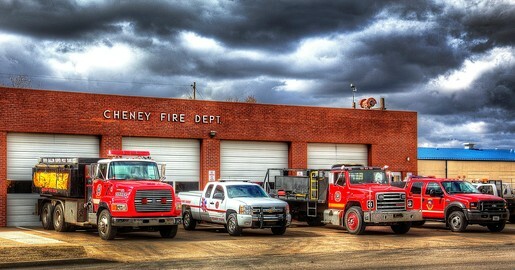 The City of Cheney Fire Department responds to all types of emergencies covering a 223 square mile radius outside of the City limits as well as within the City limits. The area encompasses Erie, Morton and Grand River townships in Sedgwick County, Vinita and Evan townships in Kingman County. The department, on average, responds to 250-400 fires per year. Firefighters also respond to emergencies and provide weather spotting during severe weather. The fire department consists of 22 volunteer firefighters. Ten are EMTs and three are certified divers. EMTs supply medical assistance at all types of emergencies as well as special events. The fire department also provides fire safety training to schools and groups interested in fire safety. Anyone interested in becoming a volunteer should contact the City Office, 540-3622. Burn permits are available at City Hall, 131 N. Main, during normal business hours. Apply for your Cheney-Sedgwick County burn permit online by clicking here. 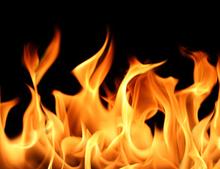 Apply for your Kingman County burn permit online by clicking here. PORTABLE OUTDOOR FIREPLACE: A portable, outdoor, solid-fuel-burning fireplace that may be constructed of steel, concrete, clay or other noncombustible material. A portable outdoor fireplace may be open in design, or may be equipped with a small hearth opening and a short chimney or chimney opening in the top. 2012 IFC, 202. RECREATIONAL FIRE: An outdoor fire burning materials other than rubbish where the fuel being burned is not contained in an incinerator, outdoor fireplace, portable outdoor fireplace, barbeque grill or barbeque pit and has a total fuel area of 3 feet or less in diameter and 2 feet or less in height for pleasure, religious, ceremonial, cooking, warmth or similar purposes. 2012 IFC, 202. The Cheney Fire Department has developed the following policy using the International Fire Code as adopted by the City of Cheney for the basis of the policy. 1. Portable outdoor fireplaces shall not be operated within 15 feet of a structure, property line or combustible materials. 2. Portable outdoor fireplaces shall not be used on a combustible deck..
3. Recreational fires must be enclosed by some noncombustible fire ring at least 1 foot in height above the ground and shall not be constructed within 25 feet of a structure, property line or combustible materials. 4. Outdoor fireplaces, other than portable, must be constructed of noncombustible materials and shall not be constructed within 15 feet of a structure, property line or combustible materials unless constructed under the provisions of the International Residential Code. 5. Outdoor fires that are offensive or objectionable because of smoke emissions or when atmospheric conditions or local circumstances make such fire hazardous shall be prohibited. 6. Combustible materials which could cause a fire to spread shall be eliminated or at least mowed short in the immediate area prior to ignition. 7. Ashes shall be discarded in a noncombustible container and kept outside of any structure. 8. Only charcoal or clean, dry and seasoned firewood can be used for fuel. Firewood can be a maximum of 2 feet long. 9. Do not use flammable and combustible fluids such as gasoline, alcohol, diesel fuel, kerosene or charcoal fluid to light and relight fires. 10. Trash, garbage, leaves, asphalt, petroleum products, paints, rubber products, plastics, paper, cardboard, treated wood, construction debris, metal or any substance that normally releases toxic emissions, dense smoke, or obnoxious odors when burned shall not be used as fuel. 11. While a fire is burning or smoldering it must be attended at all times. 12. Buckets, shovels, garden hose or a fire extinguisher with a 4A or greater rating shall be readily available for use while a fire is burning or smoldering. 13. Burn bans by the State of Kansas, Sedgwick county, or the City of Cheney shall be strictly enforced. This policy is in effect for the City of Cheney. Adopted this 16th day of July, 2015. Individuals who are at least 14 years old and under the age of 14 years old with adult supervision may detonate fireworks permitted within the City of Cheney. 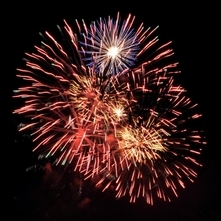 Fireworks may be detonated July 1-July 3rd between the hours of 10am-10pm and 10am-Midnight on July 4th. Fireworks may be detonated at a private residence, with the permission of an adult living at the residence. No firework may be displayed detonated, discharged, and/or ignited in a manner that may cause personal injury or property damage. If inclement weather prevents the use and discharge of fireworks on July 4th, the Mayor, in her discretion, may notify members of the public that the dates set forth shall be extended to July 5th between the hours of 10am-Midnight. The adult granting permission to detonate fireworks at a private residence shall clear the front yard of that private residence and all adjacent public right-of-way of all debris from the detonation of the fireworks before 10pm July 5th. It is unlawful for any person to discharge, ignite or fire any fireworks upon any public street, alley or avenue or in any park or public place within the City or within the fire zone of the city. To read the complete Fireworks Code please reference Chapter 7 Article 3 of the Cheney City Code.